In the near future, historians may credit Stanford University scientists with developing the first artificial skin with polymers that can sense pressure and heal itself. The material may be ideal for prosthetics. 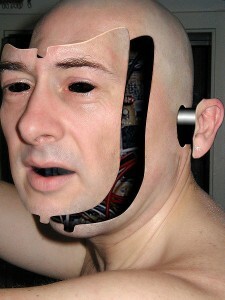 And — who could be certain to say otherwise — a cyborg. Over the past 10 years or so, there have been major breakthroughs in creating synthetic skin. But even the latest materials had some problems with self-healing, says Zhenan Bao, a chemical engineering professor at Stanford. For example, some artificial skin has to be exposed to high temperatures for self-healing, make it impractical for day-to-day use, reports R&D Magazine. Other “skins” can heal at room temperature but they can repair themselves only once because the activity changes their mechanical or chemical structure. In addition, these other materials could not conduct electricity, limiting their number of potential applications. “To interface this kind of material with the digital world, ideally you want it to be conductive,” says Benjamin Chee-Keong Tee, a researcher on the Stanford project. Bao and her team claims what he calls the best of both worlds: a plastic polymer that can self-heal that has the conductivity of metal. The secret was found in long chains of molecules joined by hydrogen bonds. The chain has weak attraction between the positively charged region of one atom and the negatively charged region of the next atom. Their work was summarized in a paper published in journal, Nature Nanotechnology. The weak attractions allow the molecules to break apart, but then they reconnect, they reorganize themselves to restore the structure of the material after it is broken or damaged, says Chao Wang, another member of the team. The consequence of this interaction is a material that is bendable, even at room temperature. The researchers say it feels like saltwater taffy left in the refrigerator. The material is sensitive enough to detect a handshake, Tee says. That standard means that it could be ideal for prosthetics. Because it is sensitive and flexible, the material on a prosthetic limb might be able to eventually detect the degree of a bend in a joint. Electronic devices coated in this material could repair themselves and get electricity flowing again without costly and difficult maintenance, particularly in hard-to-reach places, such as inside building walls or vehicles. To improve the material, the researchers want to make it stretchy and transparent. That way, it would be useful as a wrap on electronic devices or display screens.